August 2003: 18 x Su-30MKM - realised. 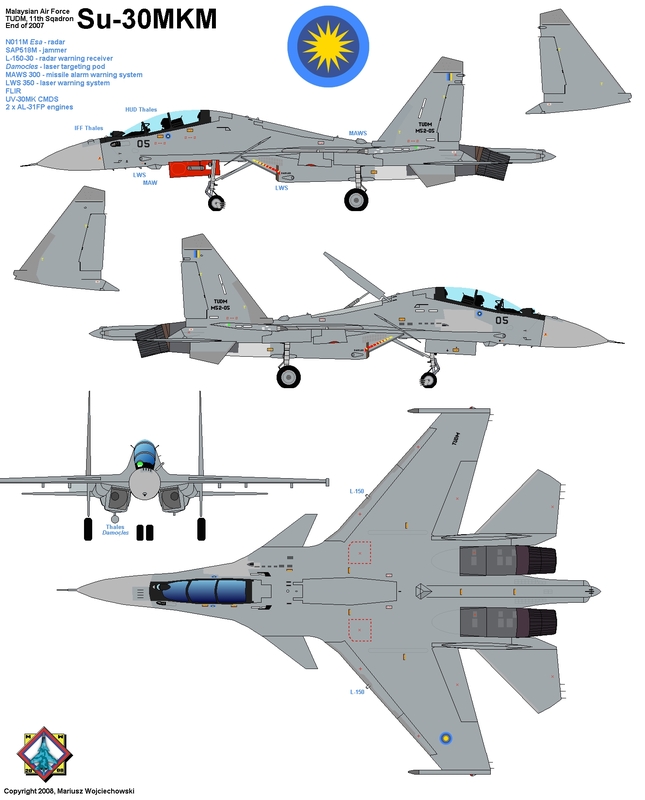 Contract for 18 x Su-30MKM was signed in 2003. After painful process of completing a multinational equipment, two prototypes was built in 2006 (rebuilded Su-30MKI no. 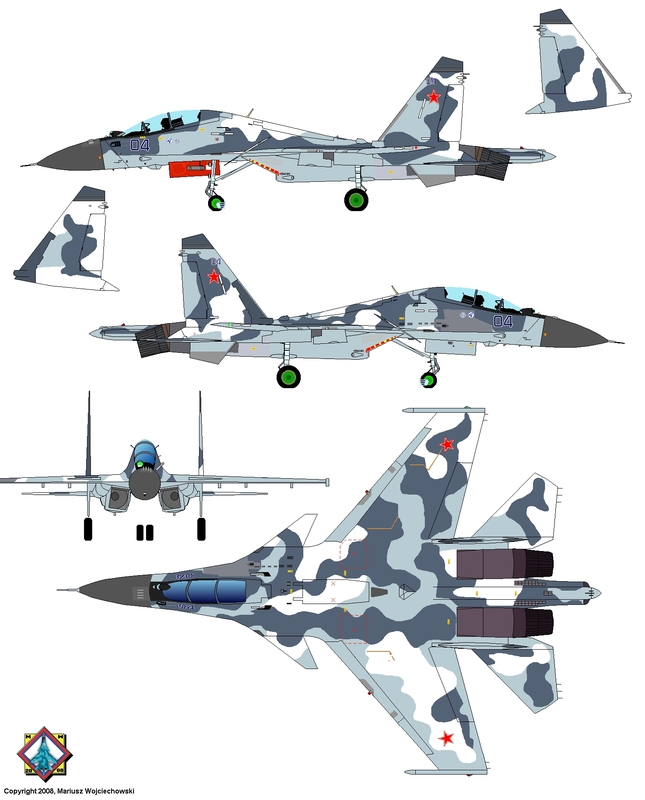 05 and 04 - third and fourth prototypes of Indian Su-30MKI, so called pre-production aircrafts). 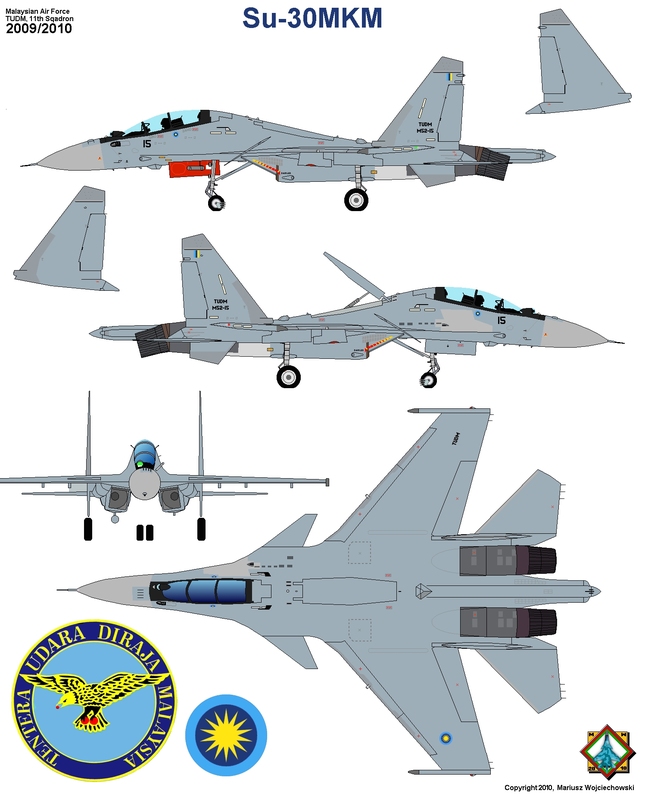 Su-30MKM is based on indian Su-30MKI with Indian, Israeli and French equipment (incl. Thales IFF and HUD, laser targeting pod Damocles, mission alarm warning system MAWS 300, laser warning system LWS 350). Thrust vectoring engines Saturn AL-31FP. First (one of two) prototype of Sukhoi Su-30MKM, end of 2006. Earlier that aircraft was a prototype of Su-30MKI. Sukhoi Su-30MKM M52-05, end of 2007. Camouflage on drawing is correct, maybe a grey colour should be a little more blueish. 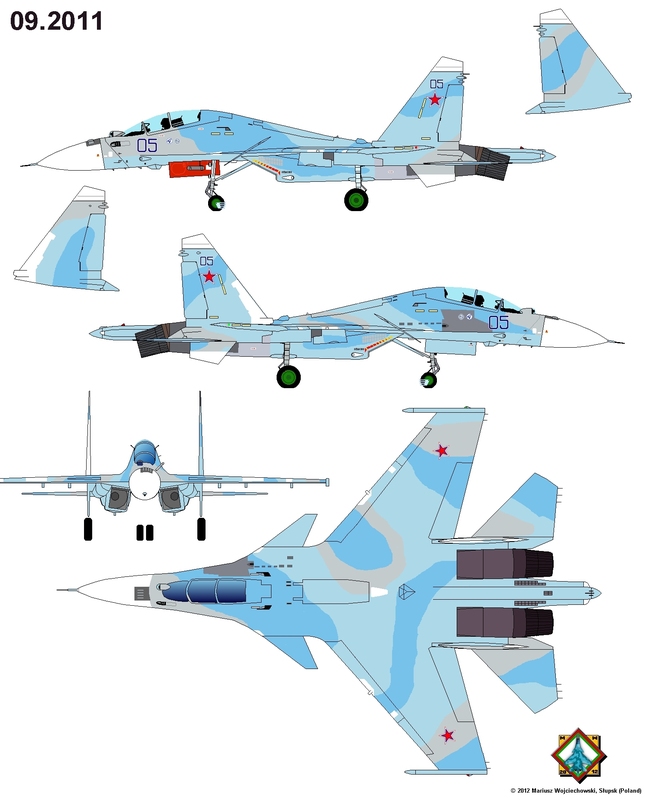 Sukhoi Su-30MKM M52-15, 2009/2010. Near cockpit is painted GIRO (name of the pilot) and ZAHID (Ahmad Zahid Hamidi), due to flight of the minister of the defense on Sukhoi in April 2010. Repainted old veteran: former Su-30MKI prototype (third, 2000), former Su-30MKM prototype (second, 2006), in September 2011 repainted and displayed by "Irkut" before SibExpoCenter stand on 7th Baikal International Economic Forum in Irkutsk city. Drawing is little hipothetical on upper surfaces.